Because of religious strictures imposed by his parents, Allie Reynolds did not play baseball in an organized fashion until after he left high school. He overcame that handicap and had an outstanding 13-year career in the 1940s and 1950s as a pitcher with the Cleveland Indians and the New York Yankees. Allie Pierce Reynolds was born in Bethany, Oklahoma, a suburb of Oklahoma City, on February 10, 1917, to David C. and Mary (Brooks) Reynolds; he was the eldest of three sons. Allie was three-sixteenths Creek Indian, descending from his three-quarters-Creek grandmother, Eliza Root Reynolds. He grew tired of explaining the three-sixteenths and often told reporters he was one-fourth Creek. Allie’s father was born in Indian Territory in 1890, attended Chilocco Indian School, and became a Nazarene preacher. Allie’s parents lived strictly by Nazarene doctrine, staying away from movies and dances. One doctrinal stand that affected their athletic young son was the prohibition of playing sports on Sunday. From an early age, Allie loved baseball. Because most sandlot and semipro games were played on Sunday afternoon, he did not play baseball on a team until after high school, but turned to other sports, including softball, track, and football. Except for football in the sixth grade, Allie did not play any school sports until he entered Oklahoma City’s Capitol Hill High School in the fall of 1933 for his senior year. He weighed 145 pounds and saw only limited action as a back on offense and defense. The Capitol Hill Redskins were an undefeated team that claimed the national high-school football championship by defeating Chicago’s Harrison Tech, 55–13. Allie had completed his high-school class work by going to summer school in 1934, but he returned to Capitol Hill High School for one more semester to play football. As the starting quarterback, he led the team to an undefeated season that was marred only by two ties. His father’s meager income as a Nazarene minister meant Allie would have to earn his own way if he wanted to go to college. He was disappointed to learn football coaches at the University of Oklahoma were not interested in him because of his light weight. However, in January of 1935, he accepted a track scholarship from Oklahoma A&M that paid $20 a month toward his tuition and room and board. Also, because of his Creek heritage, he was granted a $400 loan by a foundation. In May 1935 Allie was the Missouri Valley Conference’s high-point man for Oklahoma A&M in the annual freshman track meet. His times in the 100-yard dash, the 220-yard dash, and his distance in the javelin throw were comparable to those of the great Jim Thorpe in the 1912 Olympics. On July 7, 1935, Allie married his Capitol Hill High School sweetheart, Dale Earlene Jones. He had a summer job slinging a sledgehammer and playing baseball in the outfield for an Oklahoma City oil field equipment firm. Their first son, Allie Dale, was born on June 8, 1936. He died in an airplane crash in Wyoming in 1978. In 1935, Reynolds was the leading ground gainer for Oklahoma A&M’s freshman football team. For the next three seasons, he was the starting fullback and a tenacious defensive back on varsity teams that won only six games and lost twenty-four. One afternoon in the spring of 1937, Oklahoma A&M’s athletic director and basketball and baseball coach, Henry P. Iba, saw Reynolds throwing a javelin next to the baseball field. Iba asked the track and football star if he could help the baseball team by throwing batting practice. Allie agreed, and without any warm-ups, he started striking out batters, throwing as hard as he could. After a few batters, Iba called him in and told him to go to the equipment room and get a uniform. Allie was used primarily as a relief pitcher at the beginning of the season. In his first start as a collegian, he pitched all nine innings and hit a home run in a 3–2 victory over the University of Oklahoma. In late June 1937 the need for a summer job took Reynolds to Colorado to play on the Leyden Coal Company’s semipro team. With Allie pitching the championship game, Leyden Coal won Colorado’s first statewide semipro championship. Reynolds had a 5-2 record as Oklahoma A&M won another state conference title in 1938. On May 20 of that year, he and Earlene became the parents of a daughter, Bobbye Kay Reynolds. In 1939, Allie was elected team captain. He was 5-1 in his final college season, including a May 15 no-hitter against Southwestern Oklahoma State University. Coach Iba advised Reynolds to consider a career in professional baseball and set up a meeting for him with Cleveland Indians scout Hugh “Red” Alexander. The Indians signed Reynolds, paid him a $1,000 bonus, and assigned him to their Springfield, Ohio affiliate in the Class C Middle Atlantic League. Plagued by control problems, he nevertheless compiled an 11-8 record. Because he had not yet completed his college education, Reynolds returned to classes at Oklahoma A&M for the fall semester of 1939. Later, he took correspondence courses, completing a bachelor of science degree in June 1942. Cleveland promoted Reynolds to the Cedar Rapids (Iowa) Raiders of the Class B Three-I League, where he had a 12-7 record for the 1940 season. On March 8, 1941, Earlene gave birth to their third and last child, James David. Reynolds opened the 1941 season at Wilkes-Barre, Pennsylvania, in the Class A Eastern League. He appeared in only three games with no decisions before being sent back to Cedar Rapids, where he had a 10-10 record. As he had in 1941, Reynolds began the 1942 season with Wilkes-Barre. He became the Eastern League’s premier pitcher with an 18-7 record, including eleven shutouts. He was named the right-handed pitcher on the league’s all-star team (Warren Spahn was the left-landed pitcher). After the Eastern League season ended, Reynolds was called up to the Indians, and he made his Major League debut on September 17, 1942, as a reliever against the Washington Senators. As the 1943 season began, Cleveland had high hopes for Reynolds to replace Bob Feller, who was in the navy. The 1943 game that established the six-foot, 195-pound Reynolds as a coming star was a 12–0 shellacking of the Yankees on July 2 at League Park. He finished the season with an 11-12 record and a league-leading 151 strikeouts. Pitching for a second-division ballclub in 1944, Reynolds posted an 11-8 record, which gave him the best winning percentage among Indians’ pitchers. He was 18-12 for the fifth-place Indians in 1945, but led the league with 130 walks in 247 1/3 innings. Reynolds got off to a great start in 1946, but he had to win nine of his final fourteen decisions to salvage an 11-15 record. At the end of the 1946 season, Reynolds was the subject of trade discussions between the Indians and the Yankees. During a World Series game at Fenway Park, Larry MacPhail, the president of the Yankees, asked Joe DiMaggio which Cleveland pitcher would be best for the New Yorkers, Red Embree or Reynolds. DiMaggio said he could hit Embree but had never been successful against Reynolds. MacPhail made the trade, sending second baseman Joe Gordon to the Indians in exchange for Reynolds. Allie started the 1947 season year with back-to-back shutouts, including a two-hitter against the Boston Red Sox on April 23. He duplicated the two-hit shutout against the Red Sox exactly a month later. He finished the season with a 19-8 record and a .704 winning percentage, the league’s second best. The Yankees easily won the American League pennant and defeated the Brooklyn Dodgers four games to three in the World Series. Reynolds had a complete-game, 10–3 victory in Game Two and a no-decision in Game Six. The Yankees acquired left-hander Eddie Lopat from the Chicago White Sox in 1948, and he, Reynolds, and Vic Raschi became a dominant pitching trio throughout most of Allie’s remaining years in baseball. Reynolds opened the 1948 season with five straight victories and finished with a 16-7 record for the third-place Yankees. He was 17-6 in 1949, as the Yankees edged Boston for the pennant on the last day of the season. 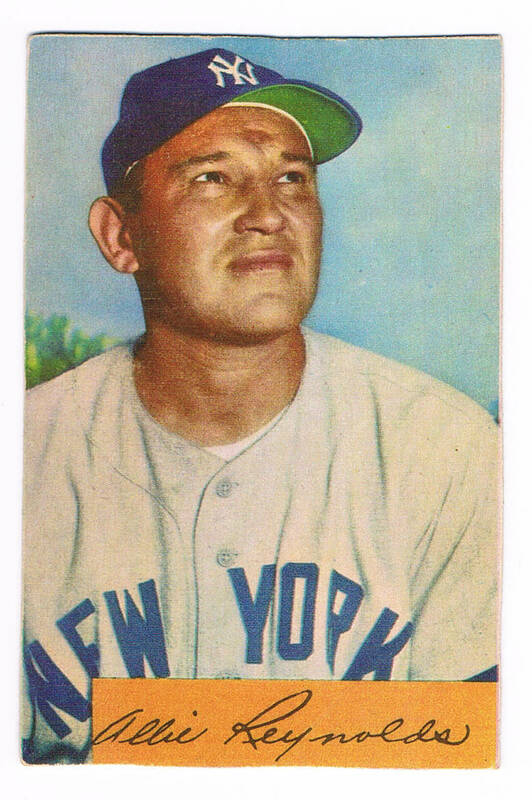 In Game One of the World Series against the Dodgers, Yankees first baseman Tommy Henrich hit a ninth-inning home run off Don Newcombe to secure a 1–0, two-hit shutout for Reynolds. In Game Four Allie came into the game in the sixth inning and retired all ten batters he faced (including five strike outs) to save Lopat’s 6–4 win. Going into the 1951 season, Reynolds was the Yankees’ main pitching concern. Doctors had told him he had several bone chips floating in his elbow and an off-season operation might be needed, but Reynolds chose not to have the surgery. To combat the pain in his back and elbow, allergies, and a tired feeling that may have been pre-diabetes, he started eating a prescribed four oranges per game. If the Yankees were concerned about Reynolds for the ’51 campaign, they needn’t have worried. The thirty-four-year-old right-hander had one of his finest seasons, which included pitching two no-hitters. On the night of July 12, in Cleveland, he topped Bob Feller in a 1–0 squeaker. Yankees’ center fielder Gene Woodling homered in the top of the seventh for the only score of the game. Allie ended it with a strikeout of second baseman Bobby Avila. Going into the final weekend of the season, the Yankees led the Indians by 2 1/2 games. The Yankees had four games at home against arch-rival Boston including a Friday double header. Reynolds faced 18-game-winner Mel Parnell in the opener and had an 8–0 lead with two outs in the top of the ninth inning. He had issued four walks but not a hit as he prepared to face Ted Williams. Williams hit a towering foul ball behind home plate that was muffed by catcher Yogi Berra. Reynolds threw a second fastball in the same spot, and Williams popped it up again. Berra caught it for the final out of the game, preserving the no-hitter. When Raschi won the nightcap, the Yankees clinched the pennant. Allie became the first pitcher in the American League to pitch two no-hitters in a season. After the second one, Yankees broadcaster Mel Allen began calling Allie “Super Chief,” a nickname that stuck. Reynolds completed the 1951 regular season with a 17-8 record and a 3.05 ERA over 221 innings. He led the American League with seven shutouts and, showing his versatility, had seven (retroactive) saves. The Yankees met the New York Giants in the World Series. Riding the momentum of their amazing late-season surge capped by Bobby Thomson’s storied home run off Ralph Branca, the Giants rolled over Allie and the Yankees in Game One, 5–1. The Yankees were confident they could win a fourth consecutive pennant in 1952, a feat accomplished only twice before. The team started slowly but finished two games ahead of the Indians. Reynolds had the only twenty-victory season of his career at 20-8. He had a 2.05 ERA, six shutouts, and led the American League in strikeouts with 160. His second-place finish in the MVP voting was the highest of his career. In the World Series, the Yankees and Dodgers squared off in Game One in Brooklyn. Reynolds pitched well but lost 4–2 to surprise starter Joe Black. Allie got revenge against Black with a masterful 2–0 shutout in Game Four that evened the Series. The Dodgers won Game Five to go ahead three games to two. Reynolds relieved Raschi with two outs in the eighth inning of Game Six, and saved the Yankees’ 3–2 victory. In Game Seven he relieved Lopat in the fourth inning. He gave up one run in three innings and was the winning pitcher in a 4–2 victory that gave the Yankees their fourth consecutive World Series championship. Reynolds spent the winter in Oklahoma City building his oil business. As a prelude to spring training, he achieved a longtime ambition in mid-February by winning the National Baseball Players Golf Championship, beating Giants shortstop Alvin Dark, 1-up, in Miami, Florida. The Yankees won their twentieth American League pennant in 1953. Reynolds, now primarily a reliever, had a record of 13-7 with thirteen saves. The Yanks defeated the Dodgers in six games for their record fifth consecutive world championship. Reynolds was the winning pitcher in Game Six after relieving Ford in the eighth inning. By winning his seventh World Series game, Reynolds tied a record held by Yankees pitcher Red Ruffing. It was Allie’s last World Series game. He went home to Oklahoma to trade his baseball glove for oilfield gloves. A successful winter in the oil business and an aging right arm combined to convince him that 1954 would be his last baseball season. Reynolds continued to work as both a starter and a reliever in 1954. On September 23, he pitched his last Major League game, beating the Philadelphia Athletics at Yankee Stadium, 10-2. The Yankees closed the season with 103 victories, more than in any of their five previous seasons. But the Indians won 111 games for a new American League record. Reynolds finished with a 13-4 record and a .765 winning percentage, the best of his career. In his thirteen Major League seasons he had started 434 regular-season games and relieved in 309. At season’s end, he had not made up his mind about retirement. He continued his representation of American League players in talks with baseball management on pension matters. In an interview on February 25, 1955, with sportswriter John Cronley of the Daily Oklahoman, Allie announced his retirement from baseball. Living in Oklahoma and working in the oil business all of his retirement years, Reynolds became the sole owner and president of Atlas Mud Company. His active participation in Oklahoma civic and charitable causes was extensive. One of his favorite causes was the YMCA baseball program. In 1960 he headed a fund drive to build a new YMCA in his hometown of Bethany. On April 24, 1982, the new baseball stadium at his alma mater, now called Oklahoma State University, was dedicated in his honor. On October 28, 1983, Allie’s wife of 48 years, Earlene, died after a lengthy battle with cancer. On November 16, 1991, Allie was inducted into the Oklahoma Hall of Fame. More than 1,200 people attended the black-tie event that was televised statewide. Reynolds was a member of the Yankees All-Star team selected by former manager Casey Stengel. In 1989 he was honored with a plaque in Monument Park at Yankee Stadium. Reynolds did everything he could to promote his Native American heritage. He served as president of the National Hall of Fame for Famous American Indians at Anadarko, Oklahoma. His last public appearance was on October 3, 1994, when he was in Anadarko for the dedication of a portrait in bronze of Kiowa Chief Stumbling Bear. Suffering from lymphoma and diabetes, Reynolds entered Oklahoma City’s St. Anthony Hospital in December 1994. He died on December 26, 1994, at the age of seventy-seven. He was buried at Oklahoma City’s Memorial Park Cemetery after American Indian services celebrating his Creek heritage. Bischoff, John Paul. Mr. Iba: Basketball’s Aggie Iron Duke. Oklahoma City: Western Heritage Books, 1980. Burke, Bob, Kenny A. Franks, and Royse Parr. Glory Days of Summer: The History of Baseball in Oklahoma. Oklahoma City: Oklahoma Heritage Association, 1999. Bucek, Jeanine. The Baseball Encyclopedia, 10th edition. New York: MacMillan, 1996. Golenboch, Peter. Dynasty: The New York Yankees 1949-1964. Englewood Cliffs, NJ: Prentice Hall, 1975. Halberstam, David. Summer of ’49. New York: William Morrow and Company, 1989. Kahn, Roger. The Head Game: Baseball Seen from the Pitchers Mound. New York: Hartcourt, 2000. Parr, Royse and Bob Burke. Allie Reynolds: Super Chief. Oklahoma City: Oklahoma Heritage Association, 2002. Telephone conversation between Thomas Bourke and Allie Reynolds’s daughter Bobbye Kay Ferguson on February 12, 2011.